Those who pre-ordered Microsoft's brand-new Surface for Windows RT tablet in Europe were met with dissapointment as the company announced it was experiencing problems shipping units abroad. Although no reason was given for the delay nor a specific date for delivery, customers who didn’t receive their device on the promised date are receiving an apology and a gift card from Microsoft instead. Buyers will be notified via email as soon as their order has shipped and will be offered a single-use coupon for up to €50 (or £50 for UK customers) toward their next purchase from the Microsoft Online Store. Delays also hit shipments to Canada and thus customers in that country will receive the coupon as well. Some customers were told they would get the Surface before October 30, while others have been told the ship dates have been pushed back to November 2. Whatever the case it's a nice gesture from Microsoft. That said, the coupon seems to be valid only in the Microsoft Store, as oposed to the Windows Store, where customers could get their new tablet loaded with apps -- a missed opportunity if that's the case. Microsoft's Windows RT-based tablet sold out quickly in the US and later in other parts of the world. Just a few days ago, people who ordered a Surface were told they would have to wait between one and two weeks. 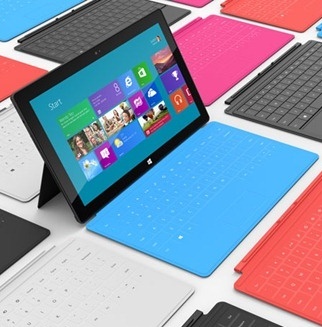 Now, new orders for the Surface tablet have an estimated three week waiting period.